"...Completely Original Icons, and Completely Original Coding!" Downloadable, and uses Client Side Saving, so you always have your savefile! Currently in the middle of being updated! -New musous! Ice, Vorpal, Lightning, and Earth. 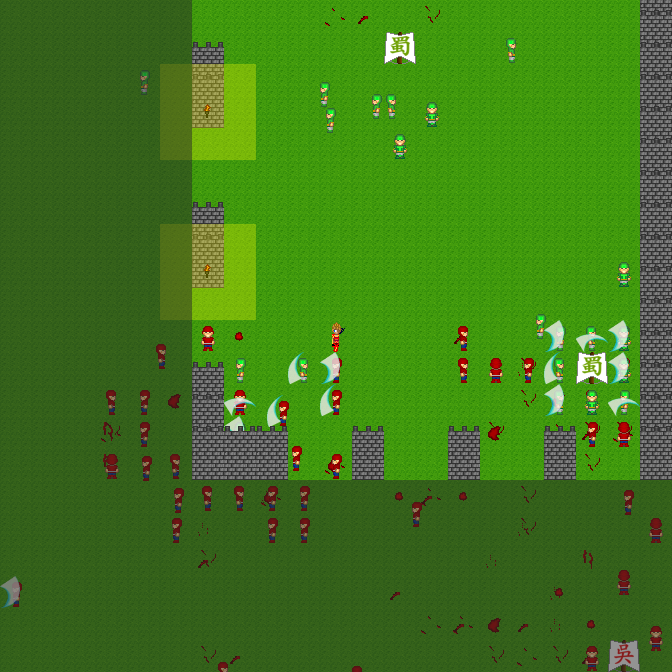 -Armies are summoned at the beginning of the each stage. - Level Up by Killing, each level up gives you 3 stat points, which you use to make your Attack, Defense, Musou, and Health stronger/better. These stats can only be upgraded 75 times, and the maximum level is 100. - Activate your musou, and your screen inverts, and everyone in view who is not apart of your kingdom will take a full hit. - A great combat system that is almost balanced. Using the stats from the original Dynasty Warriors Series, there is never an unfair battle. 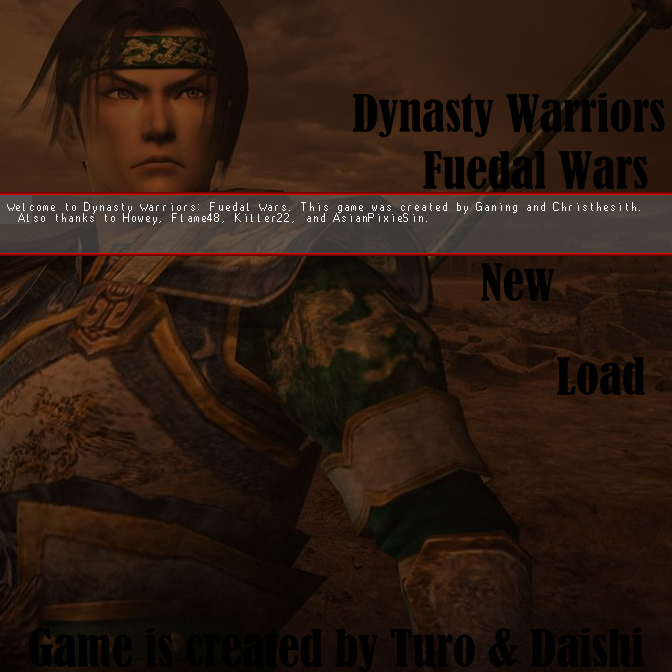 - Combo system from Dynasty Warriors 6 is in! See how high you can get it before you die! - Just a simple blood system that makes it so every time you attack someone, or are attacked, you see blood. Nothing special. - Death! When you die you are spawned back to one of the strongholds your Kingdom owns. After you die, your combos reset. - A Chat system made by Shadowdarke. Well it wasn't originally intended for it, but I bent it into it. Thanks Shadowdarke! - The three kingdoms are here! And so is Lu Bu! He joins the battle now with his forces. Crazy eh? - Now we have strongholds! You can take them over, and whatnot. The more your kingdom has the better! - 20+ Officers are available for you to become, to unlock, and to vanquish! 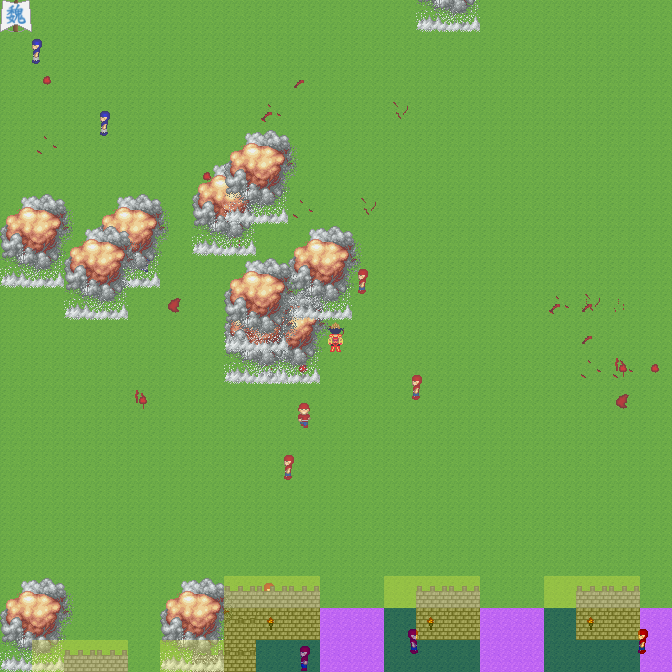 - You can now go inside your own Kingdom's castle. You can rest there, buy weapons, and equip them. - We have ranks now! See what type of general you are with every 2 level ups! In case you guys want, i can host this 24/7 lagless. Awesome! =D I really appreciate the new update you did. It makes a lot more sense when you compete for territory one at a time while moving the players along as a whole. There's a lot more balance competition to be had that way and it limits the amount of power the games runs. Though I had run to a bug where your overlay is saved when you load game, but easily solved by loading the character again, though it did prevented musou from used or charged when you get 'zap'ed by it. Say, I always like to go against all three kingdoms so will there be a possibility when it happen and what conditions? I'm slowly but surely heading towards level 75 up to a hundred. No problem! I had fun doing it! And maybe I will do something like that... it would be you against the kingdoms... nice suggestion! I love it! Will add it to the possible updates section. I am glad you liked it, and I will post some new screenshots eventually. Right now, I wanna finish the game into a whole new version, but still in need of more suggestions to help me roll along until my brain jogs out what I have in mind! Game is coming back. =) Update will come soon.